Michael&apos;s first published music was used in productions for Laserium, NASA and choreographed to by the Berkshire Ballet. He also worked with his friend Craig Huxley, learning the ‘how to’ of scoring films. Then in 1984, after working with composer Maurice Jarre on four films back to back, he was asked to score Ron Fricke&apos;s IMAX film “CHRONOS”. This led to the creation of his production company, with a focus on producing soundtracks for large format films and themed attractions. 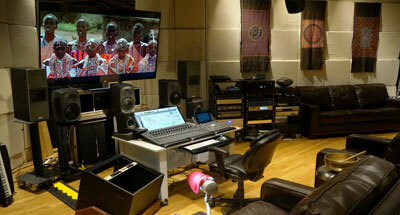 His Los Angeles based studio was set-up for scoring, producing, and mixing films in multi channel surround. Over time, a team of creative people emerged to work on different aspects of soundtrack production for the company. The early incarnation of Michael Stearns Productions produced soundtracks for 15 IMAX films, the “Earthquake” and “Back to the Future” attractions for Universal and “Star Trek, the Experience” for Paramount. Since then, there have been productions for World’s Fair/Expos, casinos, industrial films, commercials, feature films, documentaries and more IMAX and themed attractions. The team handle all aspects of creating soundtracks, from scoring music, to spotting and shooting foley, sound effect design and editorial, systems integration for themed attractions, pre-dubbing and final mixing. Click HERE, for a .pdf of the credit list. Over the last 25 years, Michael&apos;s Guesthouse Studio has been situated in Santa Fe, New Mexico. 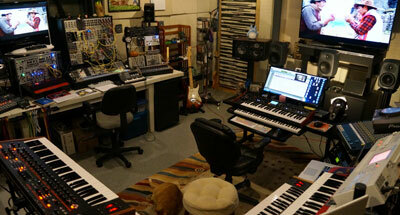 Michael recently finished the systems integration for his new two studio Guesthouse. The large mixing room is equipped with an 9.2.4 Dolby ATMOS monitoring system with overhead speakers which can also be configured for IMAX and special venue. The second room has a 7.1 surround monitoring system. Each room has it&apos;s own ProTools HDX system. The large room has a second ProTools system for simultaneous editorial during mixing and full 4K picture playback. The smaller room has Michael&apos;s analogue and digital synthesizers, and many unique acoustic instruments. Click HERE for a .pdf with a breakdown of the equipment in each room.